Experienced in fast-paced team oriented warehouse environment unloading and processing merchandize as well as preparation and loading of trailers. 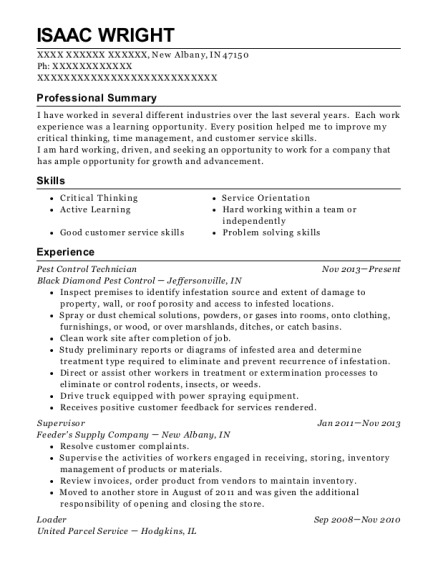 Eager and enthusiastic to expand skills. Coca-Cola Refreshments Bremerton, WA Night Loader Sep 2007－Apr 2015 Responsible for the fulfillment of orders, operating a Powered Industrial Truck (forklift) to securely stack pallets, loading and securing tractor/trailers, in preparation for next days delivery. This involves parking and backing the tractor/trailers to the dock and dropping product from racks. Jc Penny Logistics Sumner, Wa Pallet Builder Aug 2004－Sep 2007 Sorting and scanning merchandize then stacking, checking and securing pallets in preparation for distribution. Pay was scaled on performance, which was consistently above the highest scale. AV Pressure Washing Sumner, Wa Pressure Washer Apr 1998－Aug 2004 Operating a high power pressure washer to clean roofs, siding, fencing, and cement. Treating and staining cedar roofing, siding, and fencing. Paint prep and painting as well as landscaping. Distribution of advertising and talking with prospective clients. Occasional removal and/or installation of roofing and fencing as well as light remodeling. 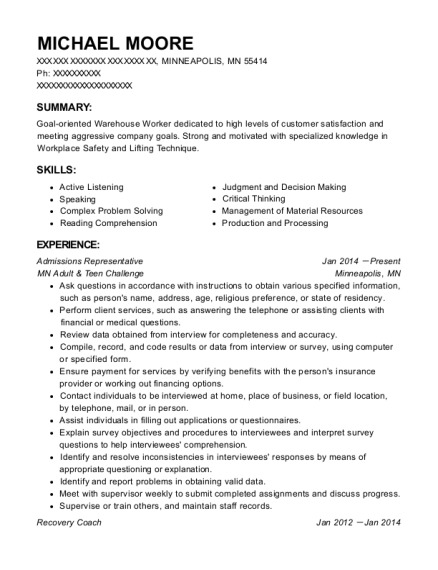 This is a resume for a Night Loader in Puyallup, Washington with experience working for such companies as Coca Cola Refreshments and Jc Penny Logistics. 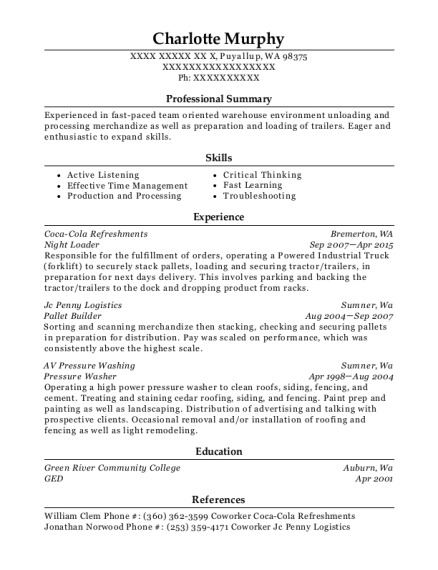 The grade for this resume is 0 and is one of hundreds of Night Loader resumes available on our site for free. 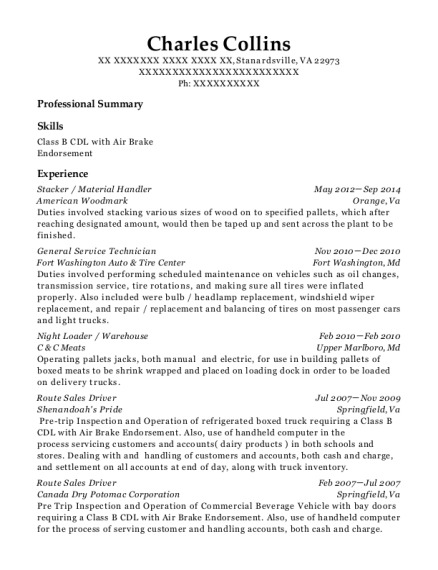 Use these resumes as templates to get help creating the best Night Loader resume.